Your dog should be groomed every 6 to 8 weeks. Maintaining a regular grooming schedule not only ensures your dog stays looking their best, but importantly keeps most dogs from getting matted (which can cost you more if matting is bad) and can cause unnecessary discomfort for your dog. What’s more, their nails will grow uncomfortably long, which can even be damaging to their paws. Together we’ll discuss exactly how you want your dog groomed before I groom your dog so you can rest assured you’ll be delighted when you pick them up. 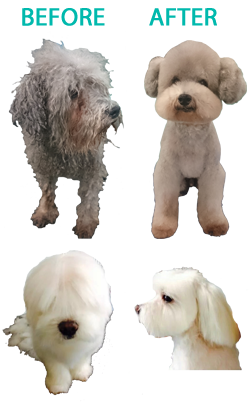 I can style your dog any the way you want as long as they have the coat to support your desired look be it a classic cut for your breed to punk! You can get a good idea of the services and fees based on the size of your dog here. I look forward to meeting you and your dog(s) soon!